If you’re in need of dustless concrete floor grinding or concrete floor polishing, consider Keystone your number one source. For large or small commercial floor polishing or prep projects, we have the proper equipment and the experienced professionals to get the job done right every time. And, all flooring prep work is done in a virtually dust-free environment, creating less mess and cleanup after we’re finished. 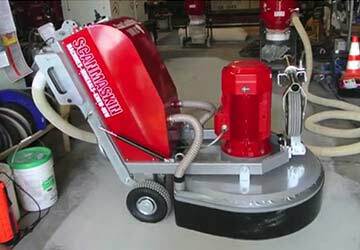 With our Scanmaskin Scan Combiflex 800 machine, we can tackle paint, coatings, overlays on concrete floors – whatever the existing floor condition, we will make sure it is properly prepped for your flooring needs. Check out this video of a Scanmaskin machine in action! If you want to beautify an existing concrete floor, then our polishing process is exactly what you are looking for! Concrete polishing is a very economical way to give your concrete floor a whole new life. You will love the results and the look of your newly-polished concrete floor. This service is perfect for retail stores, warehouses, schools, and office buildings, but really, any facility is a great potential candidate for the concrete polishing process. Many a subfloor is not made level, nor is it ready-made for new flooring. Any new floor covering will need a solid and level foundation in order to function properly. At Keystone, we have the solutions to remedy this issue. Our self-leveling process makes any subfloor ready for new flooring, and it can be installed over interior concrete, terrazzo, ceramic and quarry tile, epoxy coating systems, wood, metal and non-water soluble adhesive residue on concrete – it can even be installed over concrete treated with certain curing compounds. Keystone’s installation team will assess the job beforehand to make the best self-leveling and patching suggestions for your existing subfloor. We will make sure that your interior floor is prepped and ready to be installed with the new floor covering of your choice. We use only premium self-leveling and patching products to ensure that our job is done right, every time.